Iqbal, the great poet and philosopher had written Shikwa, Jawab-e-Shikwa, a conversation between man and God regarding the oppression of Muslims in the colonial India. Perhaps one of the most exquisite work of art ever created in support of having a new nation for the Muslims of India, it also paved for artistic inspiration and creativity. Perhaps this is why Sobia Ahmed referenced this work of art to develop and strengthen her body of work to critique the socio-political system of our country. But unlike Iqbal’s poetry of having a separate state, Ahmed’s work is more of a critique of Pakistan seventy-one years later. Sobia Ahmed is a miniature painter who did MFA (Hons) in Visual Arts from the National College of Art, Lahore. Her show titled ‘Shikwa, Jawab-e-Shikwa’ took place on the 4th of September 2018 at Chawkandi Art Gallery, which consisted of a body of work inspired by Iqbal’s poetry of the same name. Her work consists of motifs and symbols regarding angst and gloom, which are commenting on the current state of affairs in Pakistan with an unjust system of radicalization and patriarchy, which according to Ahmed are the result of western influence due to which Pakistan could never get its own solid identity. Ahmed has addressed topics like religious bigotry and ethnic discrimination by using a variety of symbols like the foliage, crows, the sun, crescents and cupids to create a greater meaning and to add depth to the visuals. 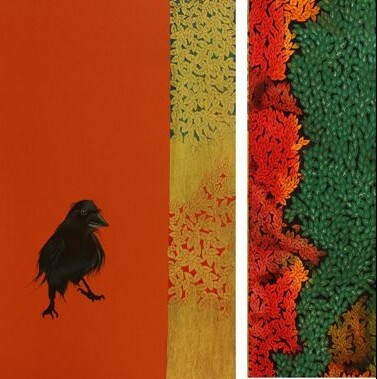 Taking the example of the diptych titled Sacredness of the crow 1, a black crow is crisply painted in detail against the background of orange while the second part of the visual is painted in ochre yellow. 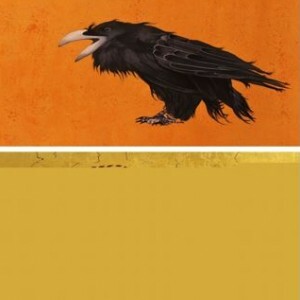 This visual could possibly be reflecting upon the political unrest and violence in our country with the stark contrast that is being created with the depiction of a black crow against color. Similarly, in Sacredness of the crow 11, one half of the painting has the similar depiction of the crow against a plain background but in the second half, a patch of green foliage is shown around which a fiery orange and red foliage is also growing, possibly trying to depict chaos. The artist has created an interesting combination of both the works despite having completely separate visuals; there is still a delicacy about her skill, which not only compliments her work but creates an interesting contrast with the concept. Natural Order is another diptych piece, possibly having the strongest and the most effective imagery. One side of the diptych consists of a portion of green foliage, a portion of a dried and darkened green and a portion of red foliage. The spreading of the darkened green foliage could possibly be depicting the impending gloom, as Ahmed states herself, while the red foliage along with a red paper boat and two crescents could simply be symbolic of bloodshed. 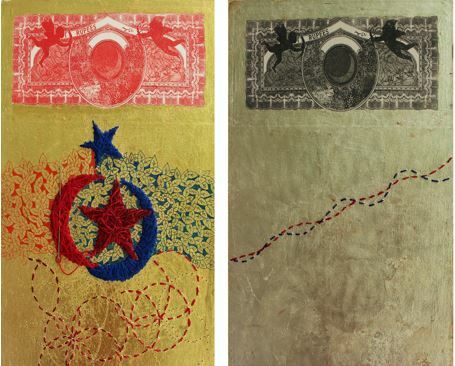 The second half of the same art piece consists of a background of gold-leaf with stars sewn in red thread over the wasli in a circle, the most intriguing part of the visual perhaps. Fallen from my Star is another interesting work which is split into a chromatic and an achromatic visual. 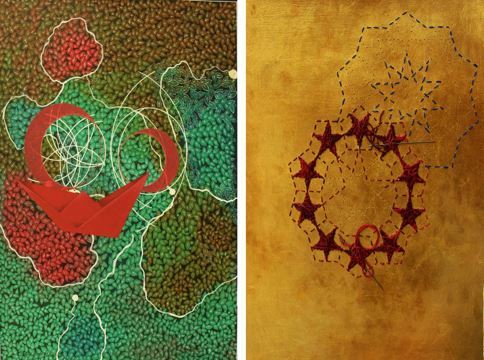 Various techniques like photo etching and embroidery have been used, certain areas have also been painted but what most stands out is the use of thread to add dimensionality in her work. The other half of the work is in grayer tones with a path of red and blue thread work following each other. If we compare this work with Natural Order, what stands out the most is the use of the red and blue threads with each other, which could be reflective of how war and peace are always conflicting and peace is never given a chance (red a reflection of war while blue the reflection of peace); hate is just being incited on a daily basis. What needs to be noted in Ahmed’s work is the use of a different form of imagery to talk about war and politics of our country; rather than addressing peace, love and war through ordinary illustrations, she has used tranquil compositions and symbolism to convey her idea. Her neatly composed visuals were not only captivating but they even left the viewer to ponder about the interesting contrast being created between the calm of the visual imagery with a concept critiquing our nations state of affairs.